And lined up some spice inspiration. 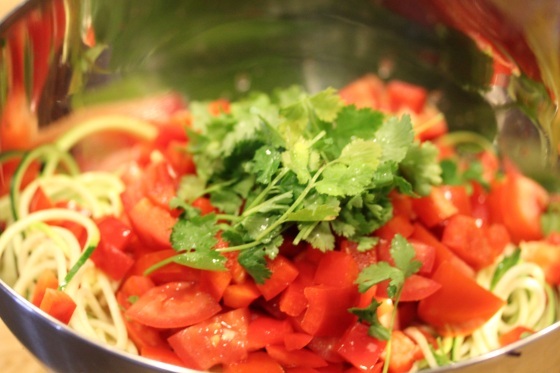 I sous chefed spiralized zucchini noodles, chopped tomato, chopped red pepper and cilantro. 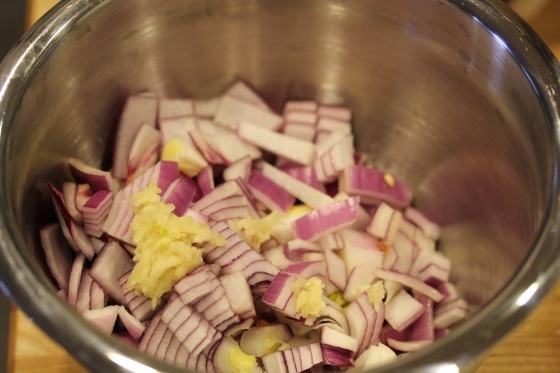 And chopped red onion and minced garlic in another bowl. Then heated the onions and garlic in a little olive oil and crumpled the tempeh over it like ground meat. I added the rest of the veggies to the skillet along with 1 tablespoon of chili powder and dashes of cayenne, chipotle, cumin and paprika to taste. The end result was a feisty tempeh skillet in about 25 minutes total. I liked the texture of crumpled tempeh, it distributed a crunchy, nuttiness throughout the dish. 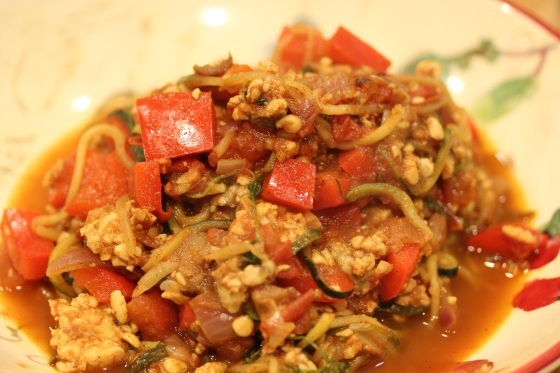 The zucchini noodles held up well to being cooked and it was a little spicy, but not too spicy. Perfect for adding a little flare and comfort to this drab Monday. 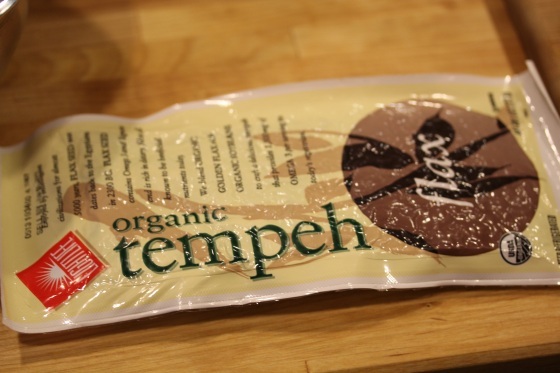 Are you a fan of tempeh? 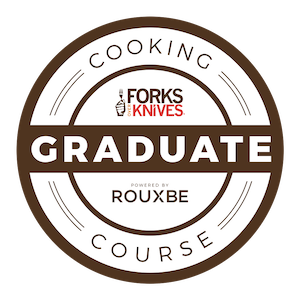 What’s your favorite way to cook it? they look perfect! the whole dish looks awesome! I love that blend of Mrs Dash, i have it and use it all the time! Tempeh, dont cook it that often. i need to do more. 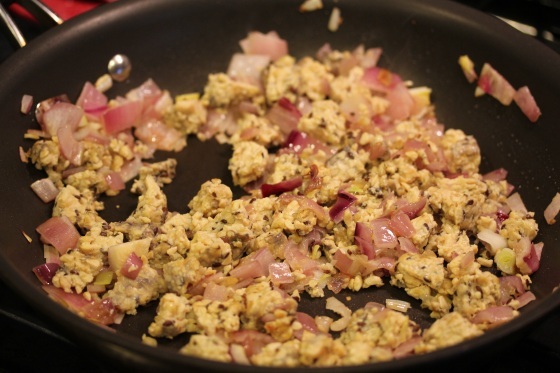 I reach for tofu but tempeh is actually better for you b/c it’s fermented so need to do it more. Thanks, I’ve discovered the fun of using spiralized veggies in cooked dishes too. I’m cutting my tofu intake considerably trying to only have it when eating out. I love that tempeh is so cheap at Trader Joe’s and the flavored LightLife stuff at Whole Foods isn’t that expensive compared to meat or what regular grocery stores charge for it. This looks really good. I don’t cook cook with tempeh much. I haven’t found a way for it to absorb marinades/flavors the way tofu does. Any advice on that? Usually when I cook tempeh in huge chunks, it does not absorb a lot of flavor. 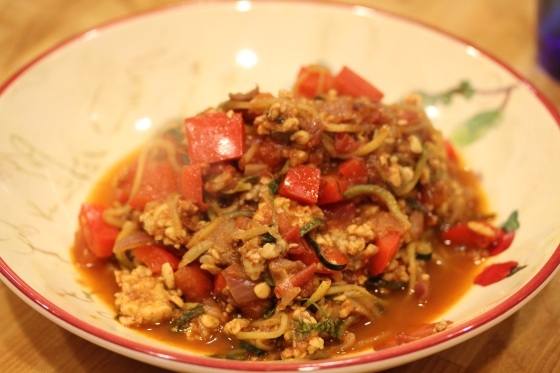 But it did in this dish because I crumpled it down and simmered in the veggie sauce for about 10 minutes and I’ve found that’s true for tempeh stir fries too. For cooking larger chunks, try marinating it overnight maybe. 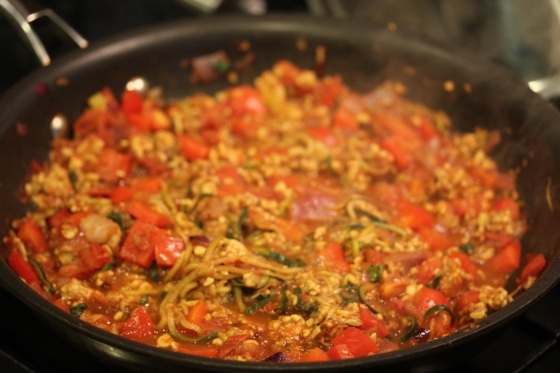 I need to get my spiralizer out– this looks great! Looks delish! I do like tempeh, it’s nice and hearty. Good to know that zucchini spirals hold up to heat. Yum! It looks delish! My hubby loves tempeh! I always think about buying tempeh and I never do, I have not had it in forever! 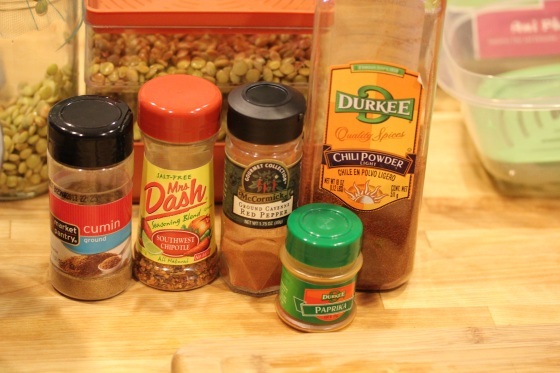 This looks great and I love cumin ! oh i LOVE tempeh. i enjoy using it with trader joes sauces. they have some coconut curry one that is to die for. probably not that healthy though. i know how did monday get here so fast and now tuesday…..
oh, that certainly looks good! i have a block of tempeh in the fridge i need to use.